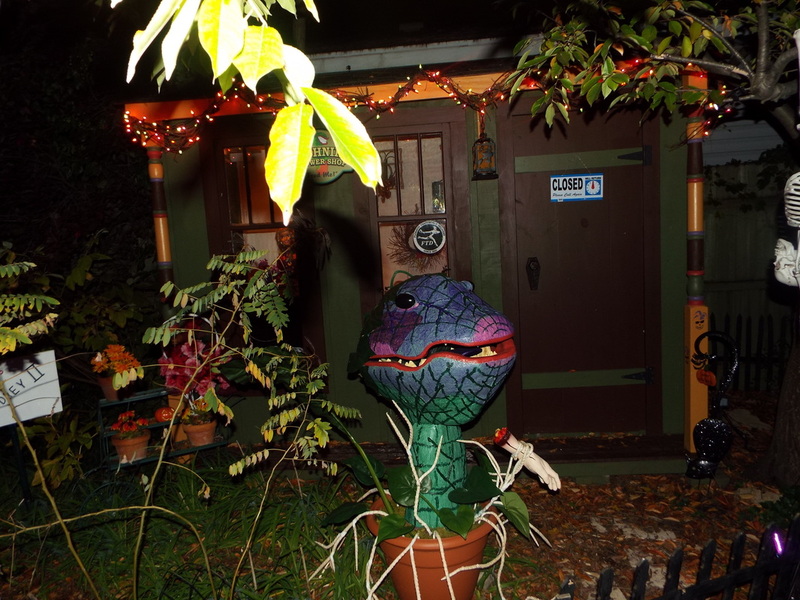 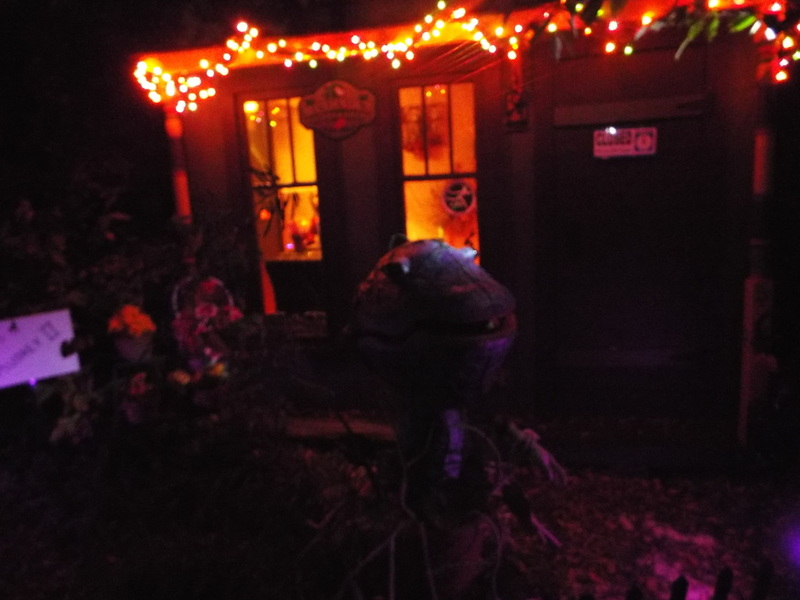 If we had to use one word to describe Count Kuhadja's, that word would be "fun" with a capital "F" - put simply, Count Kuhadja's is a whimsical yard display that effectively combines the creepiness of Halloween with a tongue-in-cheek attitude that makes to enjoyable for all ages. 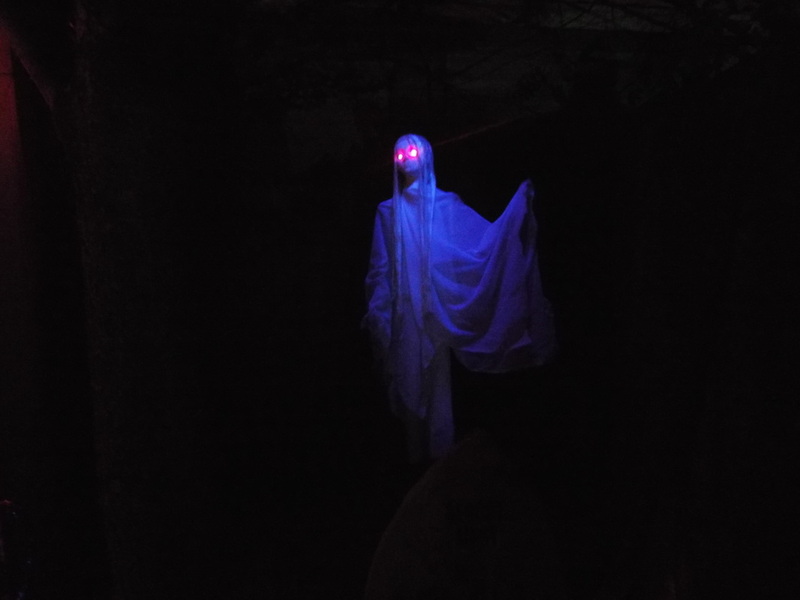 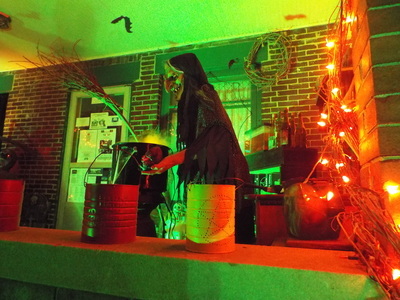 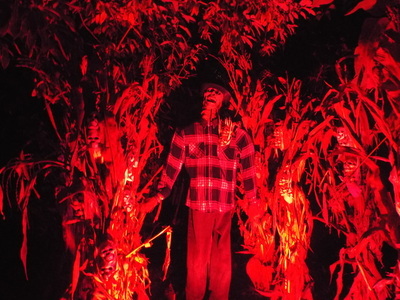 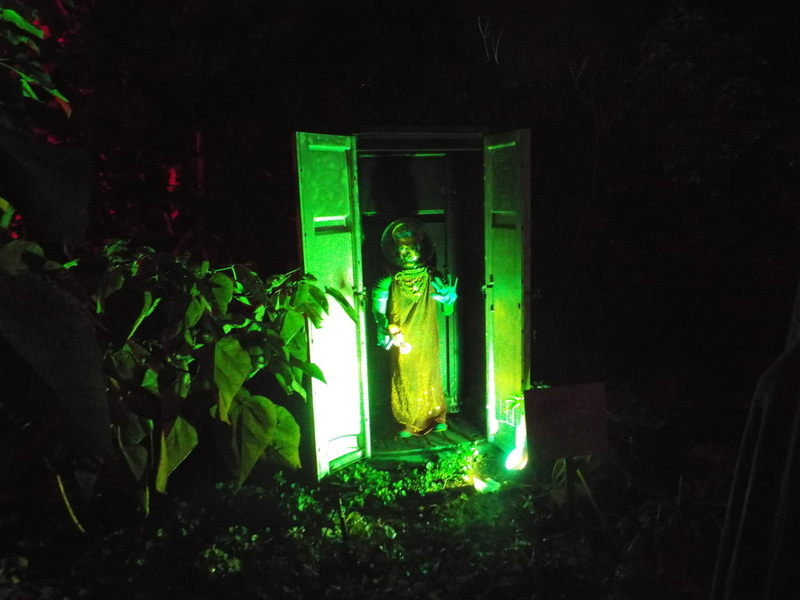 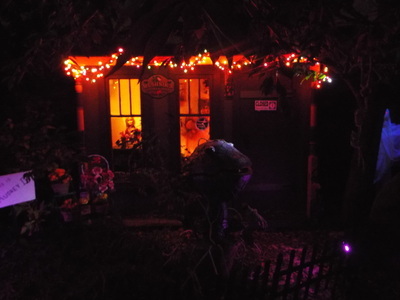 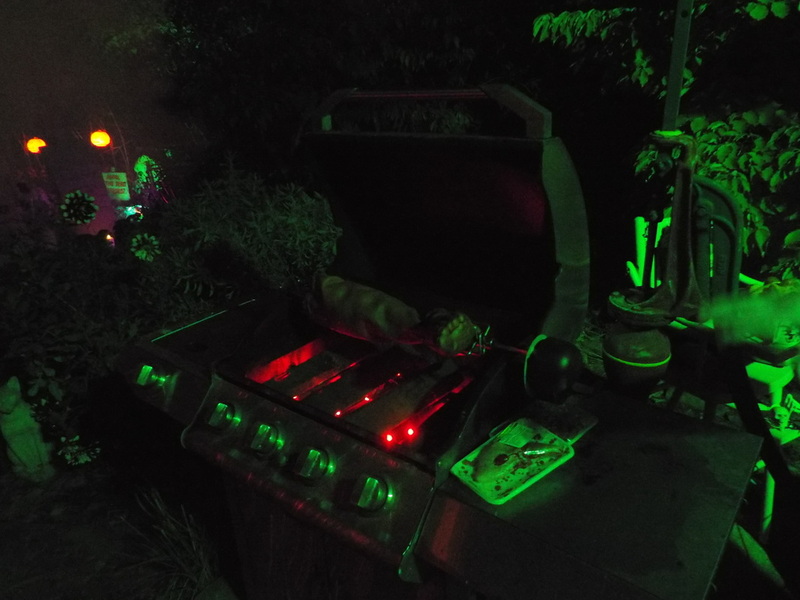 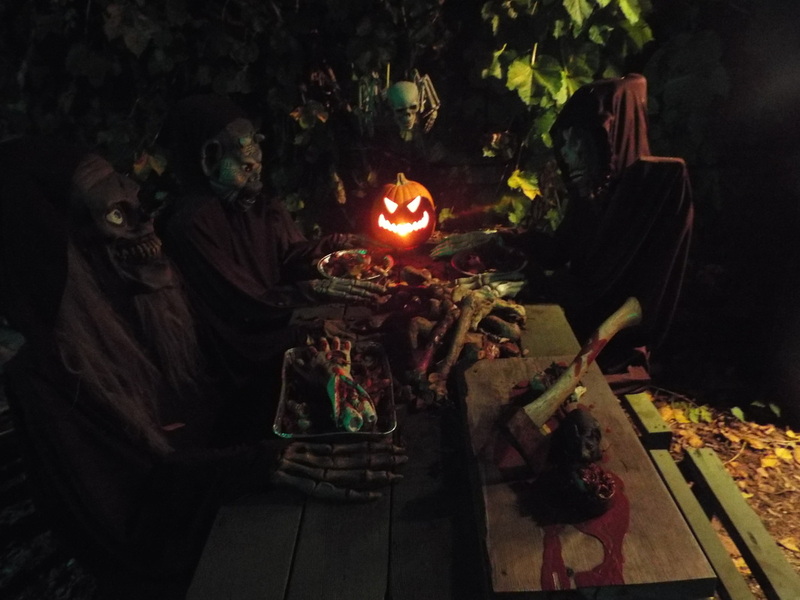 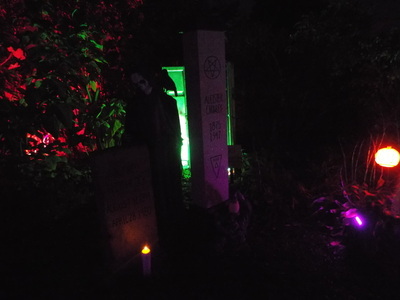 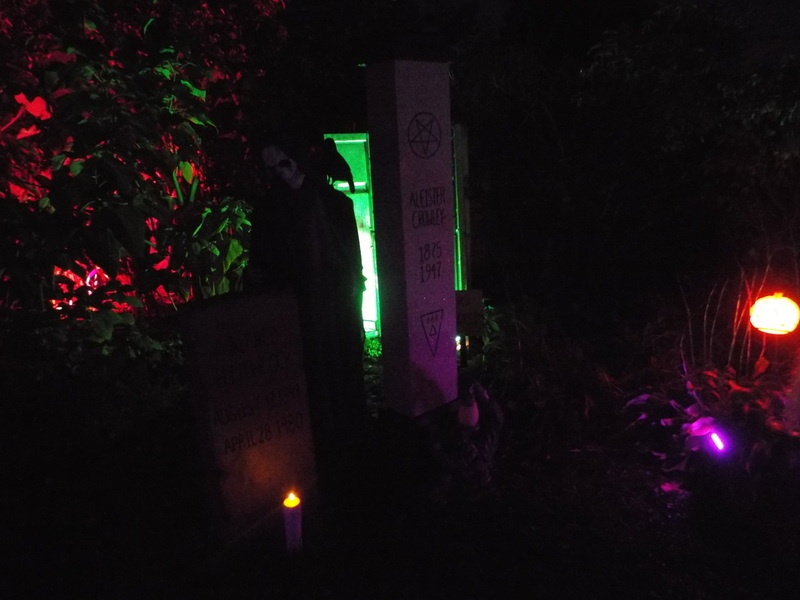 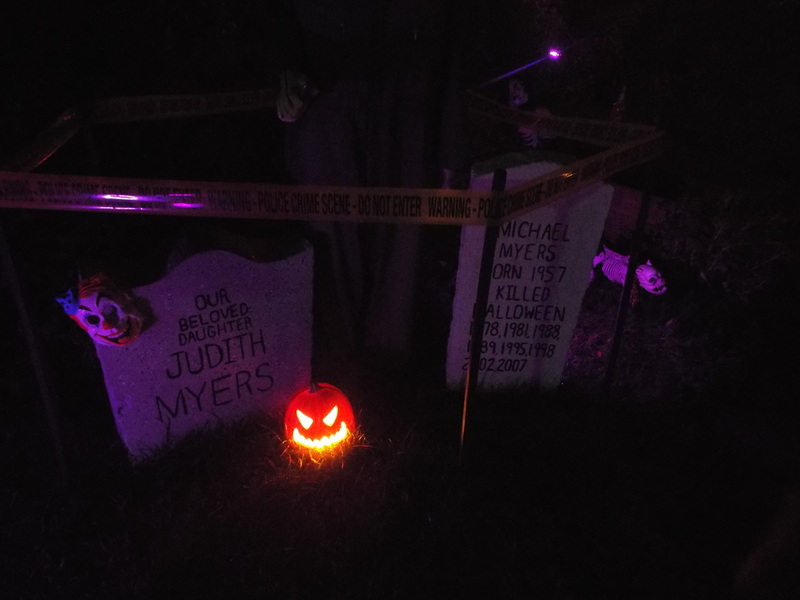 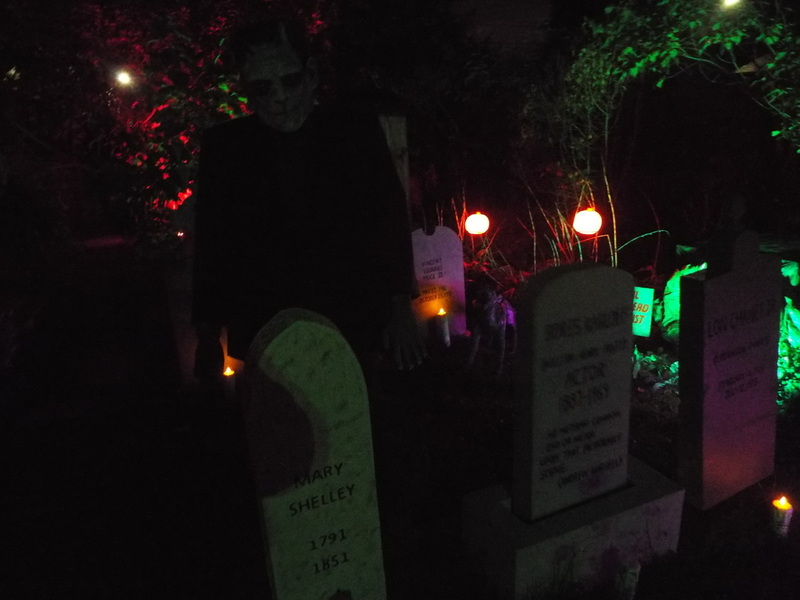 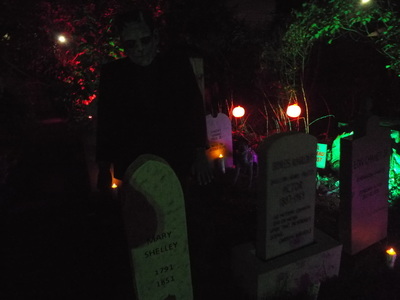 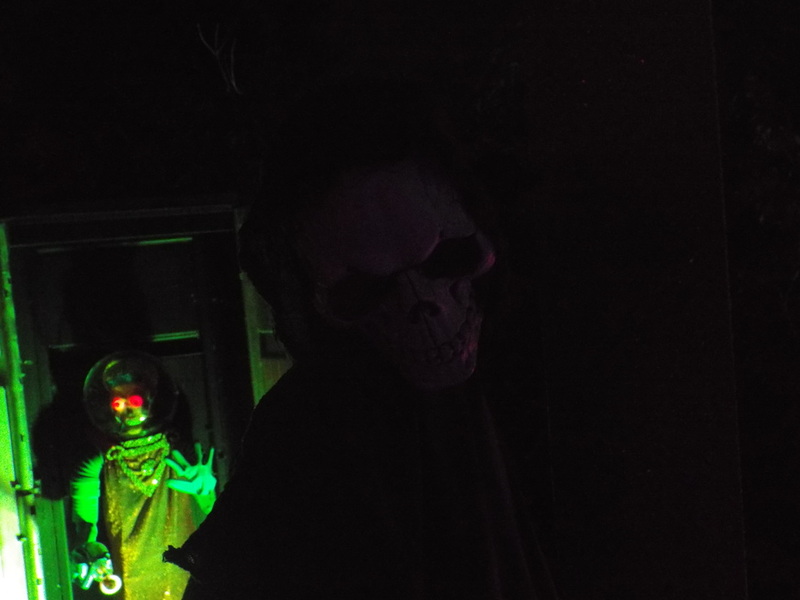 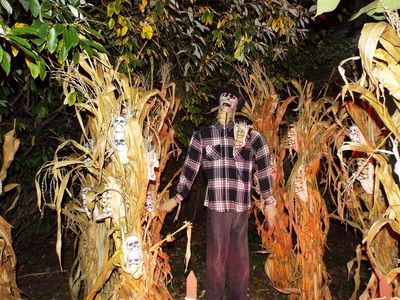 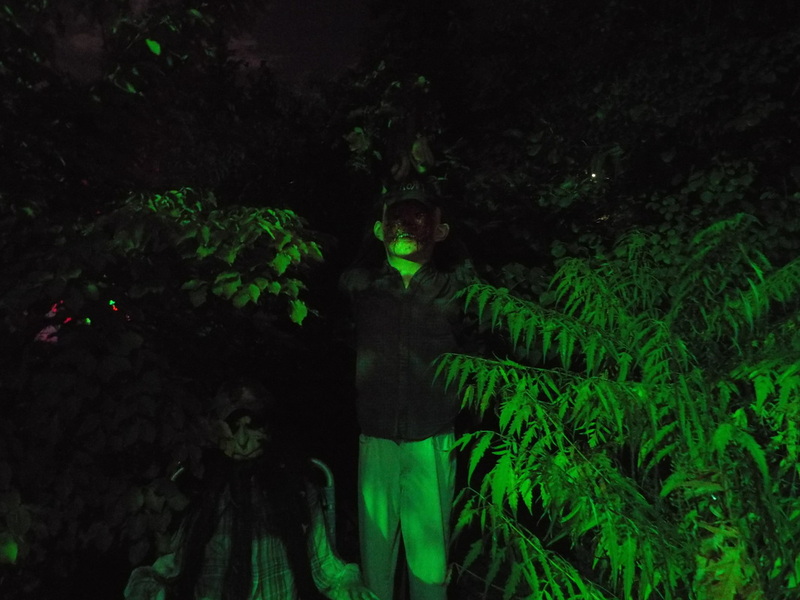 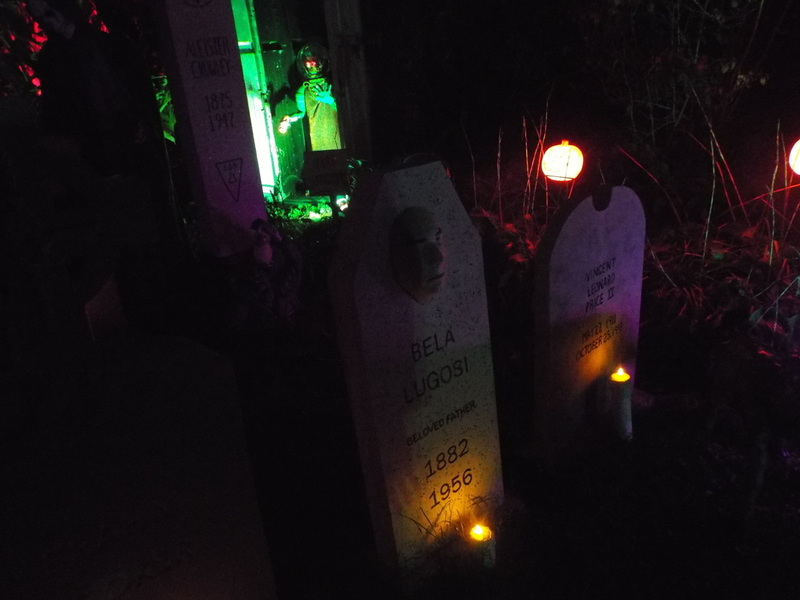 The display consists of an elaborate front porch setup that includes various full-size figures, pumpkins, skeletons, gargoyles, and other Halloween staples, all surrounded by fake cemetery gates and complemented by some creepy lighting. 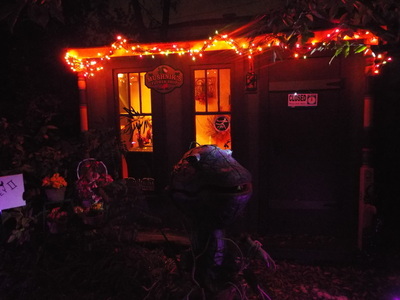 It packs a lot to look at in a small space, and if that's all there was, Count Kuhadja's would still be very enjoyable. 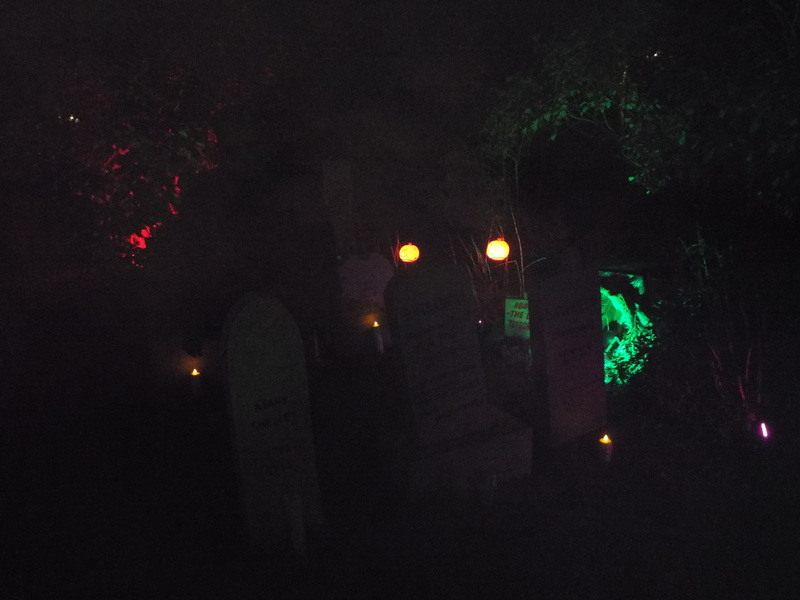 However, fortunately for any visitors, the front portion is but the tip of the proverbial iceberg, for the display continues along the side of the house and throughout the backyard. It's here where the creativity of the owners really shines through. 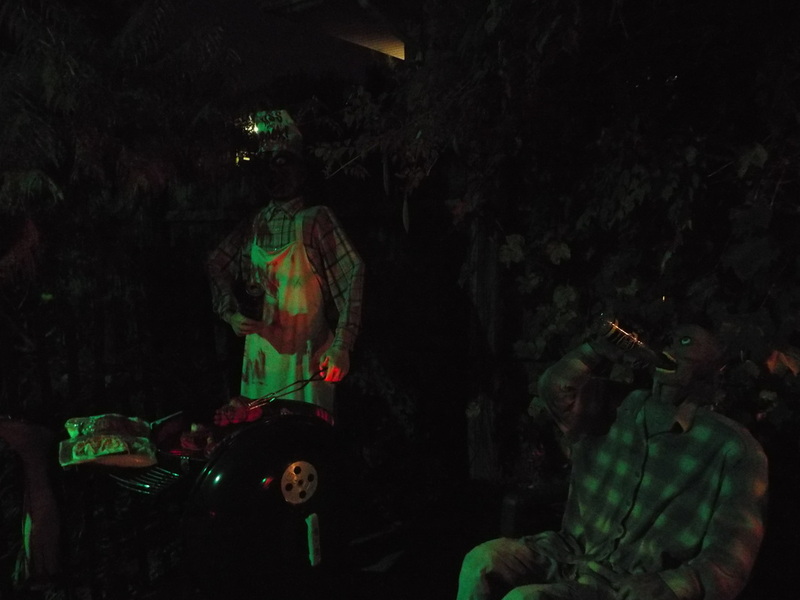 Upon entering the backyard, visitors are greeted by a skeletal bartender who utters various witty phrases. 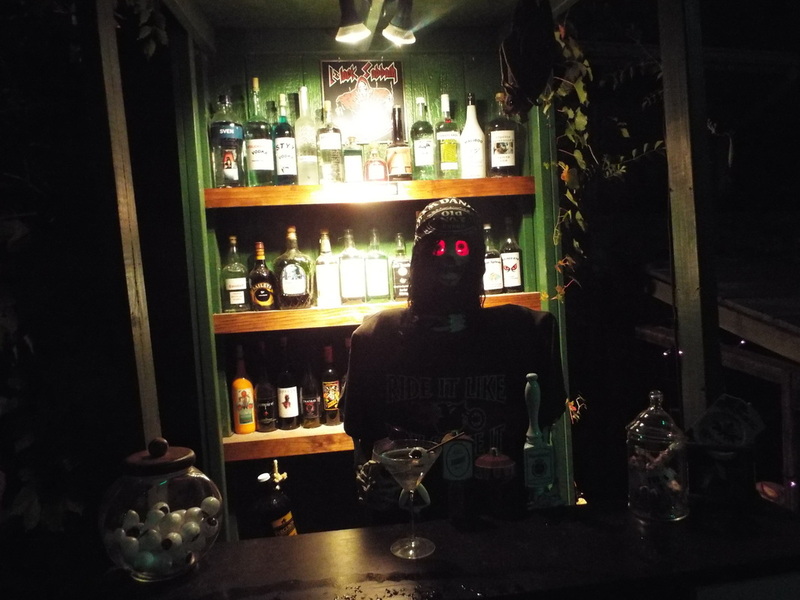 While the bartender is clever by himself, the display also features various liquor bottles on the back wall, all of which parody various horror tropes and personalities, such as "Sven" vodka featuring a photo of Chicagoland favorite Svengoolie, and "Maliboo Rum." It's a very clever display, and just one example of the creativity evident throughout. The main portion of the backyard offers something for everyone. 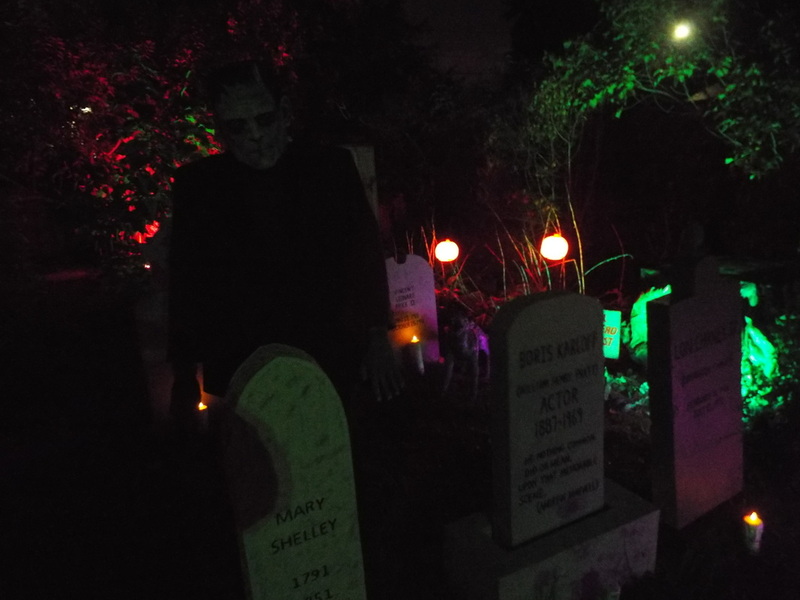 For classic horror buffs, it includes tombstones for classic horror movie actors like Bela Lugosi, Vincent Price, and Lon Chaney, Jr., as well as a great Boris Karloff Frankenstein's Monster figure hovering near Boris Karloff's tombstone. 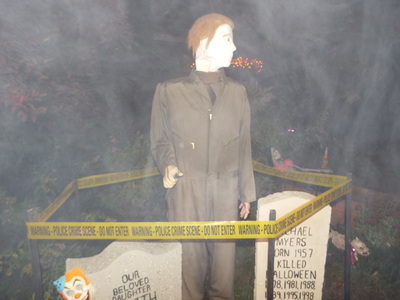 For more modern horror, the display features a nice Michael Myers setup which includes a moving Mike Myers figure standing over his own tombstone which marks the many times Michael has ":died" in the Halloween movies, as well as a tombstone for Michael's sister Judith Myers, along with a clown mask that echoes the clown mask Michael wore when he killed her. 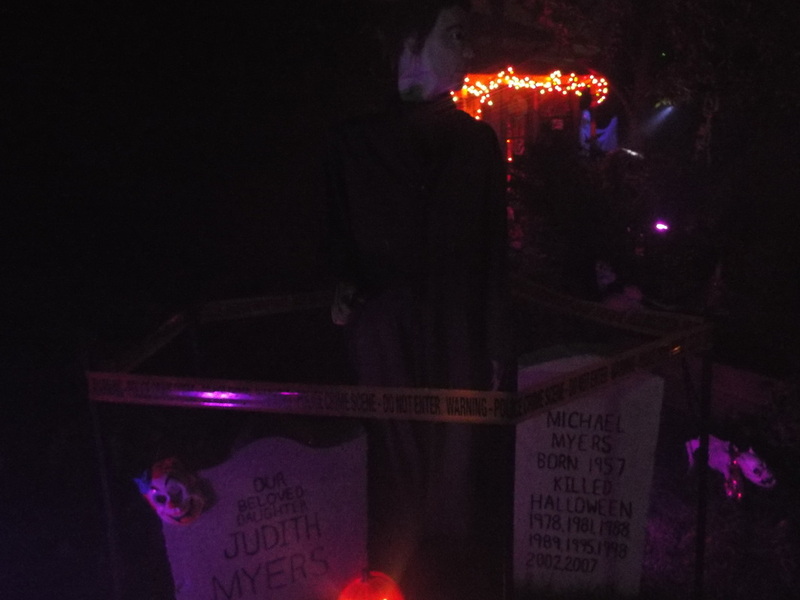 While a lot of displays feature Mike Myers, we've never seen one that also features nods to his sister, and the clown mask is the icing on the cake. For fans of other cult movies, there are homemade tributes to Mars Attacks in the form of a life size Martian, complete with sound effects and voice clips from the movie, and a homemade Audrey II from Little Shop of Horrors outside of Mushnik's Flower Shop, again complete with movie sound effects. 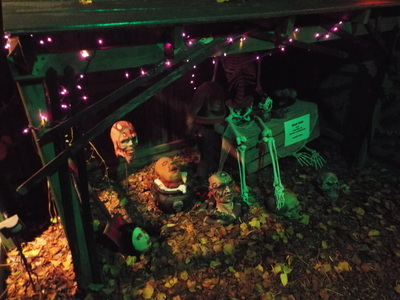 Finally, there are a number of other homemade displays, the most interesting of which is a little girl who kneels by her tricycle with her back to visitors, singing London Bridge. 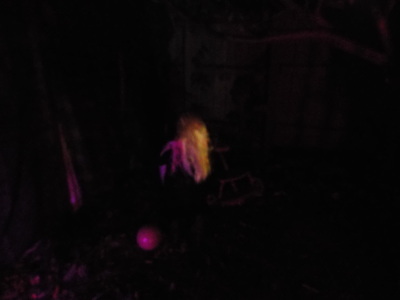 When you get too close, her head falls backwards, revealing a screaming skull with red, glowing eyes. 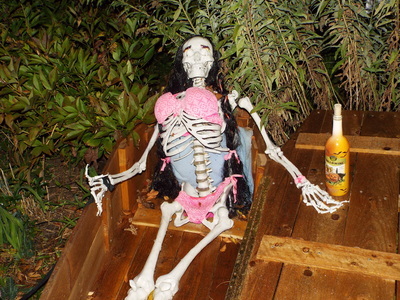 It's clever and comical at the same time. 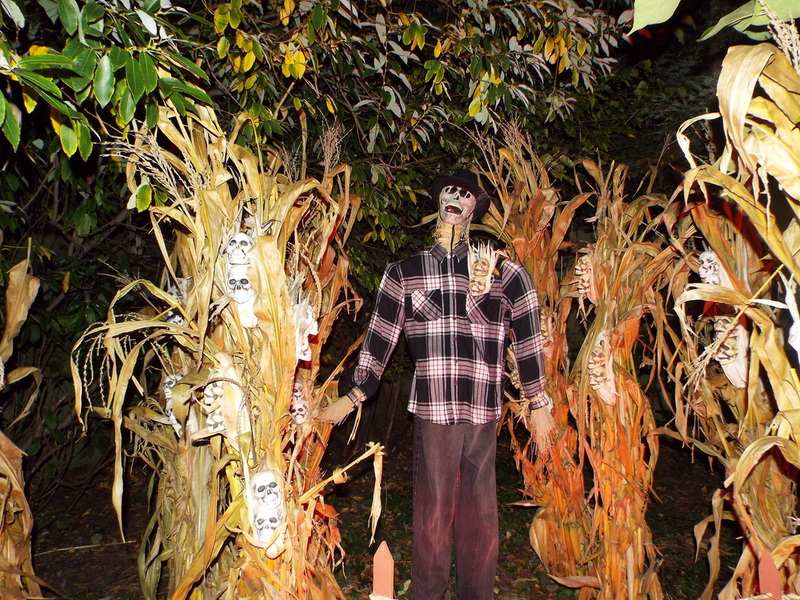 Overall, Count Kuhajda's is one of the most creative displays we've seen in our touring. We love the mix of the macabre and the humorous. 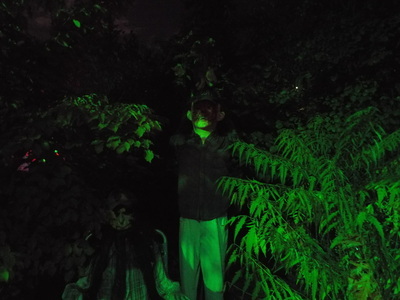 It's fun for all ages as well.. 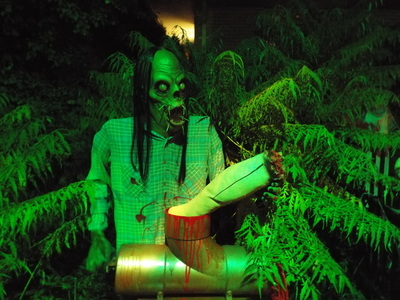 Kids will love the funny displays, like the skeletal bartender and Audrey II, and older folks will enjoy many of the others, while horror movie fans of all ages will enjoy the nods to movies and actors, past and present. 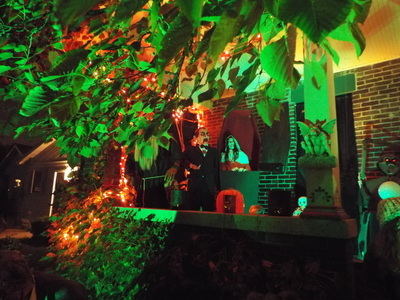 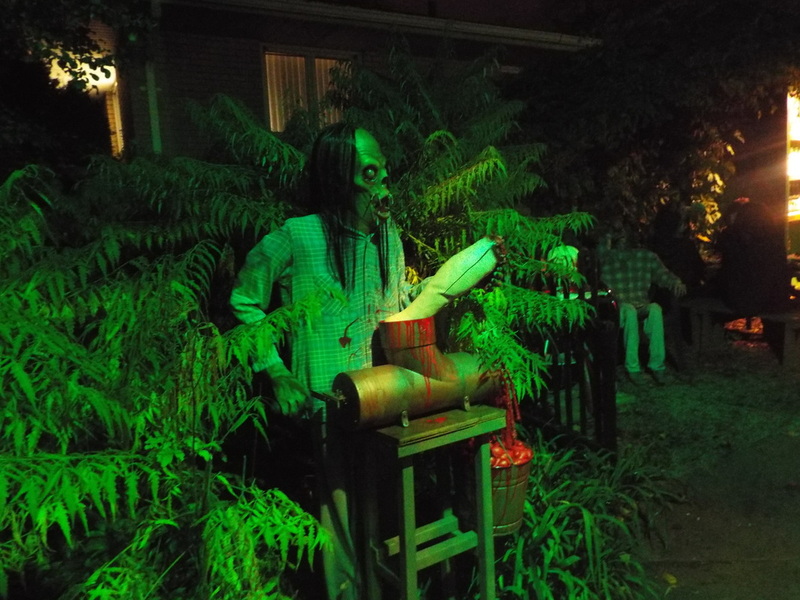 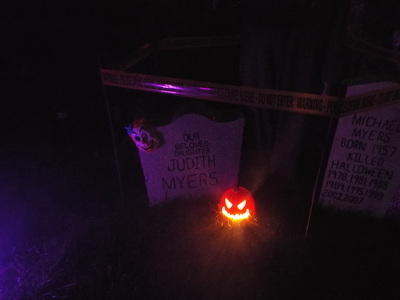 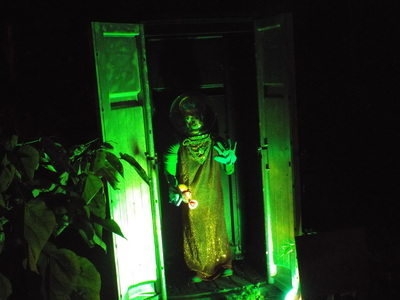 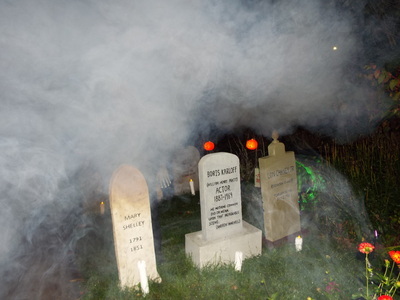 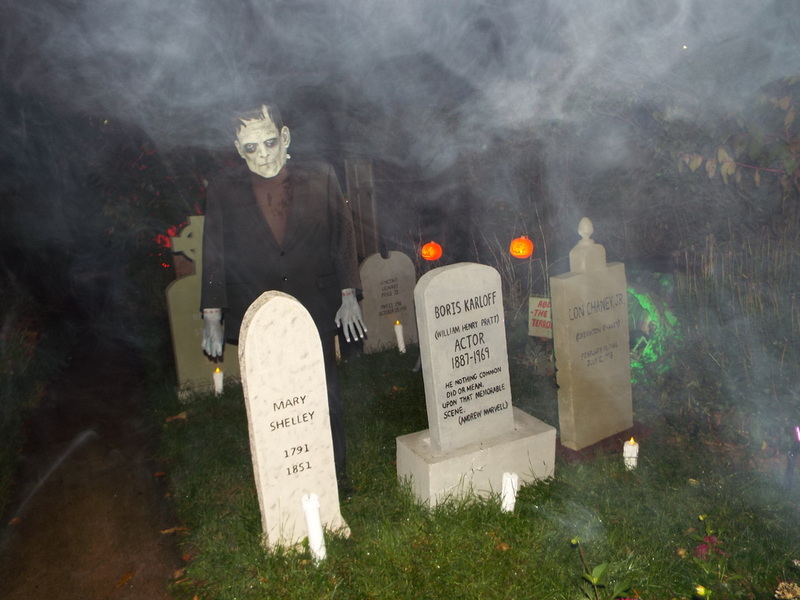 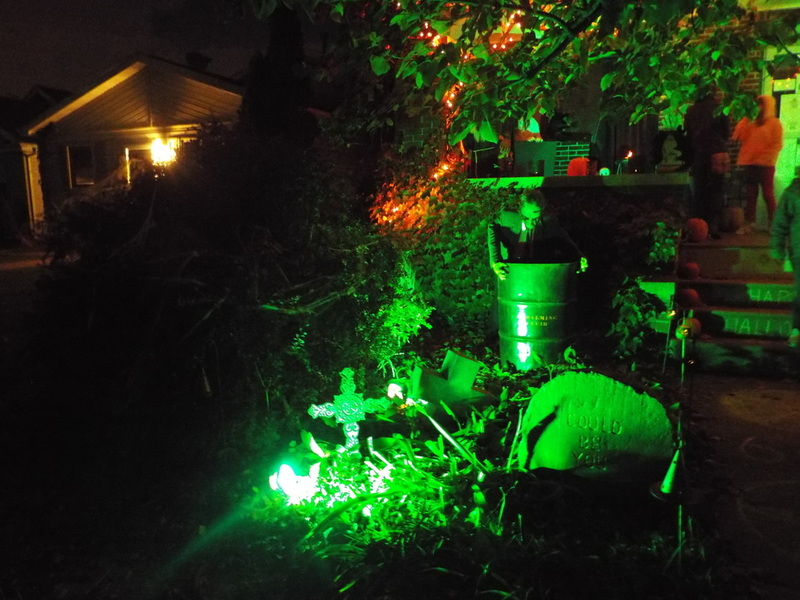 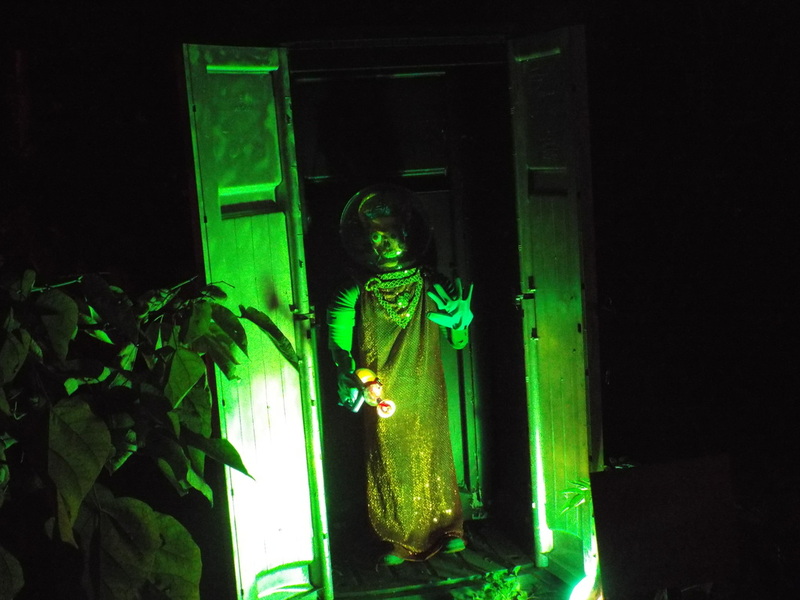 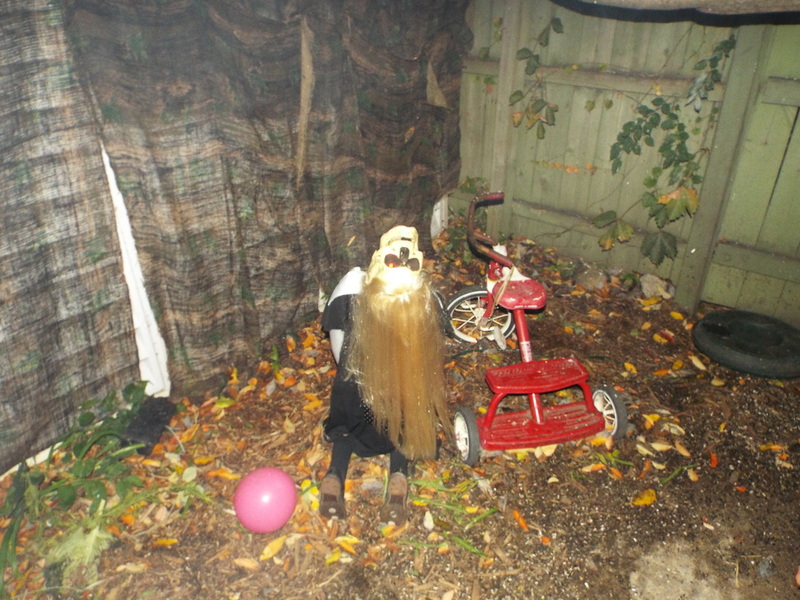 Count Kuhajda's is a clear example of the heart and dedication that home haunters put into their displays. It's clearly a labor of love, and the best recommendation that we can issue is to simply go see it! 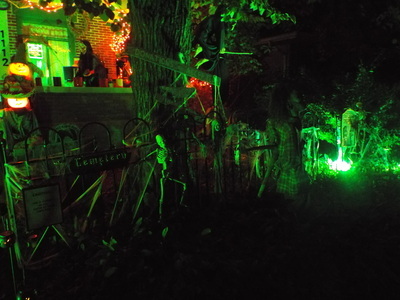 Words can only express so much, and the display is so visual that it needs to be seen in person to be fully appreciated. 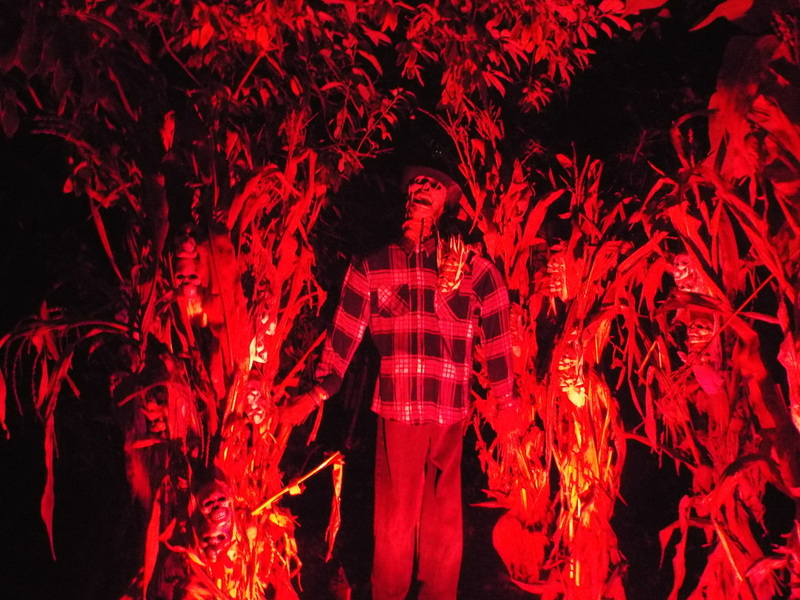 Make it a point to visit - you won't regret it!